Our volunteers are indispensable in performing tasks that help us fulfill our mission. We couldn't exist without them! Find information about the WCC's Internship Program here. There's always work to be done at the Center. The jobs aren't always glamorous, but they do all come with the benefit of getting to observe the wolves. Ground Maintenance: We could always use help cleaning, cutting grass, clearing brush, assisting with the various construction tasks and projects that arise. Guides: We are always looking for dynamic and engaging people to run visits and give educational presentations. Assistant Guides: Assist with programs, set up and clean up while participating in the educational program as a center representative. Veterinary Care: We are extremely indebted to the vets that already help us out, but we always have the need to add more to our roster. 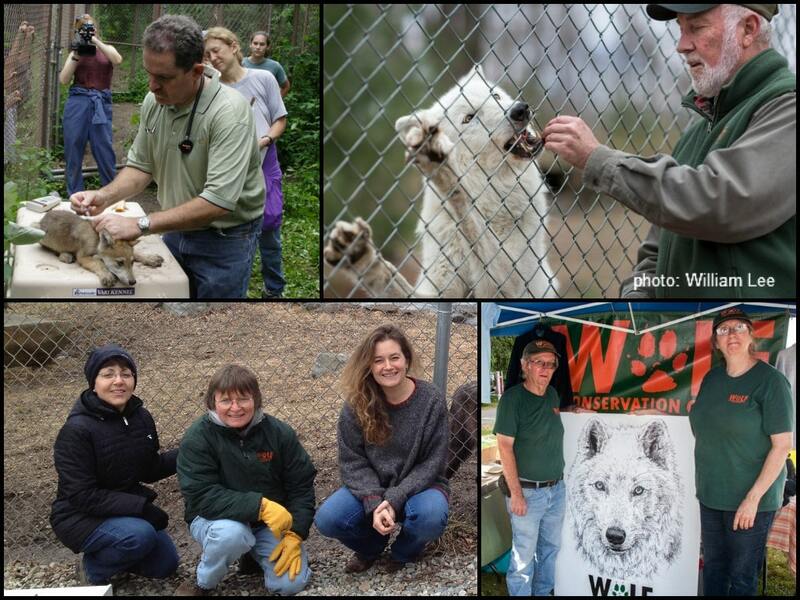 We are sustained by donations from individuals, so another huge way people of all ages can help us is by conducting their own fund-raising events for the Wolf Conservation Center. It doesn't have to be difficult or even involve too much preparation or planning – we want you to enjoy whatever you do with us or on our behalf! If you want to volunteer, please fill out the Volunteer Application below and either email it to us as an attachment or mail it via the US Postal Service. There is a $25 application fee for all volunteers over the age of 18 to cover background check costs which can be paid via cash, check, or credit card over the phone. The Volunteer Handbook below provides more detailed information on what to expect while volunteering at the WCC. We require that all onsite volunteers commit to at least 2 volunteer shifts per month for a minimum of 2 months and be at least 16 years old. Those interested in volunteering will need to attend an orientation that is held once a month. More details will be sent about days and times after your application is processed. Short-term volunteer opportunities and community service opportunities are available on a case by case basis. For additional information about volunteering, please email [email protected]. The WCC is not in a position to offer a stipend, housing, or transportation and we are unfortunately unable to consider international applicants at this time.